The following test from Expedia shows how understanding how your users interact with your forms leads to conversion rate gains. Here is (our mockup) of Expedia’s experiment – see the field deletion in Variant B? At a glance, they simply dropped the “Company name:” field and that increased their site PROFIT by $12 million a year according to Silicon.com. Why was changing this field so critical? When visitors see the “Company” field, they were confused. Visitors thought Expedia meant they should put in their Bank name. 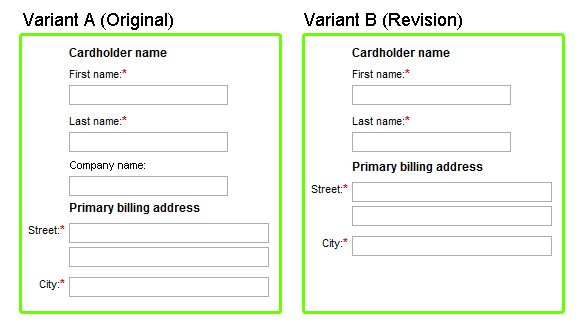 Users then put their’s Bank’s address into the billing fields. This led to failed transactions, which led to abandons. Conversion rate optimization gains are often just a function of getting your broken UI the [email protected][email protected] out of the way of your end user . . . Yes, it’s that damn simple and you need to start by understanding how users ACTUALLY interact with your funnel. Do it yourself, have us do it for you, but heck just do it. UserTesting.com – For less than $100 you can have three complete strangers go through your website, attempt to perform a task, and listen to their annotation and observe them through a screen capture. UserFly.com– UserFly is the more macro-version of UserTesting – this system allows you to watch as live user sessions play out on your site, and dig into the data. ClickTale.com– Incredible set of tools, the “attention heatmaps” in particular have provided us with double digit conversion insights on a regular basis, well worth the price of admission as well as their user session recording. Finally, worth a mention is a newer tool that has disruptive potential –GazeHawk.com provides eye-tracking studies for less than $50.00. Online solutions like CrazyEgg.com mimic the functionality without being as exacting, and most traditional eye-tracking vendors rely on expensive hardware solutions and charge 10 – 20x that fee. If you think $12 million is a big number, make sure not to miss the story of the button that increased sales by $300,000,000. Check out more Conversion Voodoo content . . . Proper placement of “trust logos” can make a huge difference in conversion rate. We put our money where our mouth is – click here to contact us today and learn how we can drastically increase your website conversion rate for no money up front, and backed by our $10,000 guarantee! Have you ever gave GazeHawk.com a try, definitely sounds like a good service to us, but how accurate is it would be the one thing I’d like to know. May I suggest three further improvements. 3. If the form is soo confusing for some add a help button. This blog post caused me to remove excess text from my opt in field. The conversion rate changed about 30% so it was worth it. Thanks and please keep posting ideas because us part time site builders know less than you think about site optimization.